"I feel really fortunate to be part of this staff," Morton said. "I come to the park each day and I look at the wall over here - just the pitching staff that I'm on - I feel very fortunate to be part of it." Morton (2-0) allowed four hits and three walks for one unearned run while striking out seven in six innings. It was a nearly identical performance to his season debut, when he allowed three hits, two walks and no runs while striking out six in a 6-1 win over Baltimore. He also got the final 12 outs in Game 7 of the World Series against the Dodgers to help secure Houston's first championship. 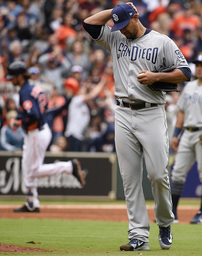 On a rotation that includes Justin Verlander, Dallas Keuchel, Lance McCullers and Gerrit Cole, Morton became just the eighth Astros starter in franchise history to give up zero earned runs in his first two starts to a season. He extended his winning streak at Minute Maid Park to six games, including the postseason, a seven-start span in which he's 6-0 with a 1.09 ERA. "You always want to contribute to the team's win and it felt good," Stassi said. "We haven't been swinging the bats like we normally can, but that's baseball. I know for sure we'll turn it around real quick." "I think there will be a lot more wins if I can throw the ball like that consistently versus the first game," Ross said. "I've got some things to learn from this one and get better for next time." The Astros now head to Minnesota, where Monday's forecast calls for temperatures in the 30s. "The elements are going to be horrible," Houston manager A.J. Hinch said. "It's just cold. There's no way around it. If they tell us to play, we're going to play." "In some instances, we've gotten our pitch, we've just missed it," manager Andy Green said. "Other instances, we've expanded the zone and put ourselves in bad situations trying to be too eager to hit. You just keep grinding." Padres: Reliever Kirby Yates will likely avoid the disabled list despite leaving Saturday night's game with a right ankle injury after throwing just one pitch. Green said Yates was still sore Sunday and wasn't available but would be re-evaluated on Monday. As the Padres' primary setup man, he has yet to allow a run in four appearances over 3 2/3 innings, striking out five. Astros outfielder George Springer left Sunday's game with leg soreness and stiffening following an infield single in the fifth. Hinch said he was "completely fine" and "probably should have stayed in the game" and that Springer will likely serve as designated hitter on Monday.